Growing your own vegetables, herbs and fruit is becoming increasingly popular, and it’s easy to get in on the action. In a few short months – weeks even – you can be picking your first harvests straight from the garden. The first thing to decide is what you want to grow – there is no point growing fruit or veg you don’t like to eat! It’s also worth starting in a relatively small way: grow the crops that it’s really worth having fresh, such as sweetcorn and salad leaves, or that really benefit from being able to ripen fully on the plant, like tomatoes and strawberries (many fruits and vegetables sold in the supermarkets are picked when still unripe to make them easier to transport). Once you’ve got the bug, then it’s time to move onto the bigger crops such as potatoes, cabbages and onions. These are relatively inexpensive in the shops, so you’re unlikely to save a lot of money by growing your own, but the range of varieties available to the home grower is much better than the supermarkets, so you can trial and test your favourites. New potatoes especially benefit from going straight from the soil to the pan – ‘International Kidney’ is the closest the home grower can get to a Jersey Royal. Fruit is a more expensive initial investment than most veg, as you generally have to buy plants, bushes or trees rather than seeds, but after that they need very little attention and can soon provide you with kilos and kilos of fruit every year. Again, it’s also possible to grow fruit not widely available in the shops, such as greengages (try ‘Cambridge Gage’) and unusual hybrids such as white strawberries. Think about what space – and time – you have to be growing your crops. Most fruit trees and bushes can be trained into, for example, cordons or fans that are perfect against a wall or fence, and can even be grown in raised beds of a minimum depth of 45cm. Alternatively, grow them as a ‘normal’ tree shape in a large pot or planter. WoodBlocX planters are a great choice here as they will not crack in a frost and give the tree’s roots plenty of space and protection. Raised beds are often used by gardeners for fruit and veg growing, and with good reason. With raised beds the soil is never compacted, so it remains really healthy year on year, and is easily topped up with fresh compost full of nutrients to grow big, flavoursome crops. 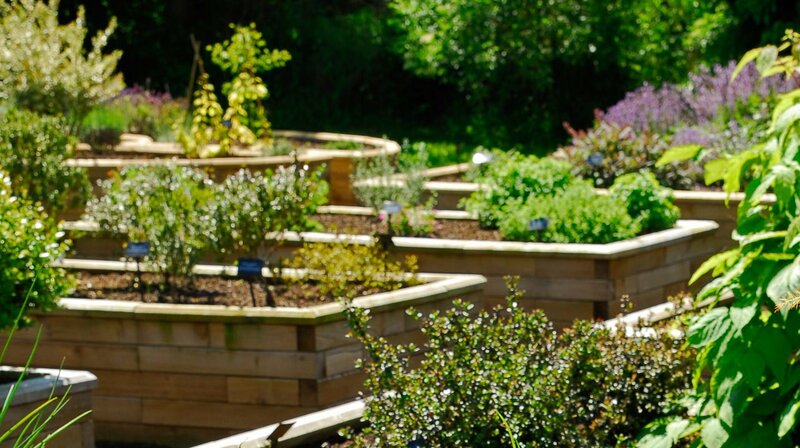 Take care that the beds are not made of materials that will leach chemicals into the soil that will be then taken up by the plants – using something like WoodBlocX (certified organic and pressure treated without nasty chemicals) means you don’t have to worry about that at all. Finally, think about the design of your growing area. Do you want to have square or rectangular beds with straight rows (attractive in their own right), or a more informal circular area, perhaps with a central fruit tree? 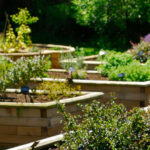 Consider what crops you will be growing: it might be worth having a segmented raised bed – either all on the same level or at different heights – to divide into areas for annual vegetables, herbs, and perennial fruit bushes and trees that need a bit more root space than the veg and herbs. Corner beds work well in this regard, but WoodBlocX can be created in almost any configuration to fit your needs and space. If inspiration is what you need, you’ll find lots of pictures of our easy to assemble kits on the WoodBlocX website. To get daily updates on all things WoodBlocX, be sure to follow us on social media; visit our Twitter, Facebook, Instagram and YouTube pages.